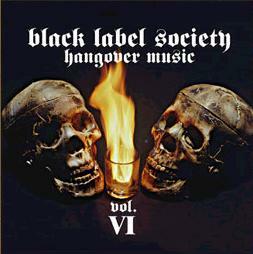 Black Label Society - "Hangover Music Vol. VI"
Well, the mighty Zakk Wylde has come up with a really incredible CD this time with an amazing variety of material. If you are only familiar with Zakk’s Black Label Society records then this record will come as shock. It is much more closely aligned with his solo record from some years back, Book of Shadows, being mostly acoustic guitar. While the BLS records pummel you into submission with heavy as hell guitar riffs and dark mean lyrics and shredding guitars, this record kills you gently! The opening number, Crazy Or High is fantastic. A mixture of acoustic guitars and heavy riffs. Queen of Sorrow has a slide guitar and reminds me of the Allman Brothers at times, but Zakk mixes in some ripping solos and heavy riffs to make it his own. They lyrics on the record are still quite dark and powerful and sung with amazing passion by Zakk, who possesses a truly unique voice. Steppin’ Stone is a very dark and tortured song. Wow. Yesterday, Today and Tomorrow is a piano ballad with some powerful vocals. Takillya is a Spanish guitar piece that leads into Won’t Find It Here. This song finds Zakk singing very softly but with a lot of feeling. She Deserves A Free Ride is a very mellow track. After this, Zakk gets angry with House Of Doom, but it has some amazing guitars and this is one of the heaviest songs on the CD. Zakk sings a bit like Axel Rose on this song. What a great rocker this song is! I really love the acoustic guitar and the vibe of the song Layne, but the stand out track on this CD, and the best song Zakk has ever written, is No Other. I can’t stop playing this track. So much passion is burning in Zakk’s vocals and playing. Woman Don’t Cry features Zakk’s longest and most intense guitar playing on the CD, despite being a southern rock style ballad. Ok... those southern rockers also have some ripping burning solos at times. A cover of Procol Harum’s Whiter Shade of Pale is played purely on piano and is passionate. The CD ends with Fear. For more information you can visit the Zakk Wylde web site at: http://www.zakkwylde.com.